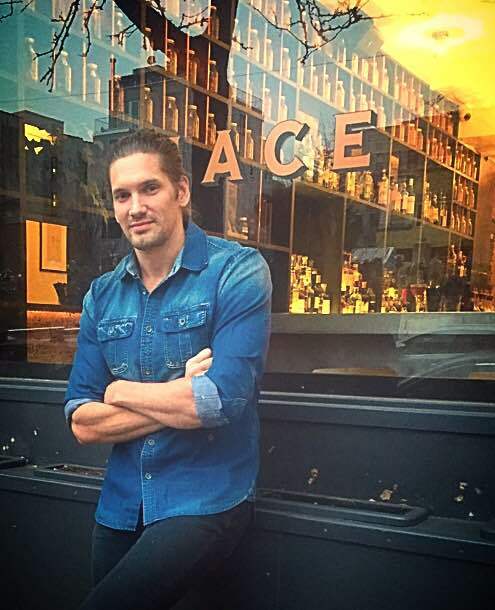 I’m Nico de Soto and I opened Mace last April in the East Village of Manhattan. I began in the industry when I was looking for a job in Australia. Bartending seemed to be a great option, that involved partying and a lot of fun. I knew nothing about cocktails but my time working in bars in Australia fuelled my curiosity. I returned to Paris and began to read books about cocktails, whilst working in local cocktail bars. I found working on classics really interesting thanks to Fred from Artisan in Paris and learnt to create drinks quickly with precision. I also met people like Tony Conigliaro in London who showed me how to work with home made syrups and infusions and challenged me creatively. In Paris I worked at Le China, then Mama Shelter as head bartender with Joseph Akhavan from Mabel. Later I joined the Experimental Cocktail Club, which was the only place I could learn something new in Paris at that time. I moved to New York because it’s a city I’d always wanted to live and work, firstly at Dram, then Painkiller. The idea was to open a bar with Sacha Petraske, but I couldn’t get a permanent visa, so I moved back to the ECC Group to open ECC London and then ECC New York. I really wanted to open my own bar, so I tried in London with Tony Conigliaro whilst doing shifts at 69 Colebrooke Row and Happiness Forgets, but it didn’t happen. I moved back to New York to work with my business partner Greg and we opened Mace. When I look back I realise I’ve worked in eleven different countries as a bartender. This is the bar I want, as it’s related to travel, spices and flavours. But, if money was no object I would have chosen another area that’s more accessible by public transport, like the West Village and maybe it would be a little bit larger. It would have the same number of seats, but with more space to move around and a bigger kitchen to produce more elaborate finger food. But most of all I would love a bar with its own lab to work on the cocktails. Regarding the music, I’d have indy and pop during the week and deep house on weekends, but definitely no jazz as too many bar in New York play jazz. When I go out I tend to go to other bars to try cocktails and see new creations as I am not the kind of guy who only drinks beer, negronis or shots. When I am in a new city I want to see everything, taste everything and check every menu. My favourite is rum to drink and to work with. You can use it in any style cocktail, whether it’s a sour, a flip, a punch, or a stirred drink. The flavour spectrum is infinite too… young, old, agricole, cachaça, demerara. Maybe it’s also because I like sugar (I eat a lot of candy) and I prefer sweeter cocktails. For me, the definition of a good cocktail is about balance of course. But it’s also about a story, with a start, a finish and different stages inside the cocktail, like a perfume as it evolves. Temperature is very important too, as many cocktails are not cold enough and not served in a chilled glass, or shaken too much and become aqueous. It’s not only about the recipe, you need to know how to do it. My favourite ingredient is pandan as it’s so easy to use. I’ve worked with pandan leaves for the last 5 years and a lot of bartenders are now discovering this product that I am crazy about it. The only problem is I want to put it in everything and I really have to control myself. One of the best cocktails I tasted last year was the Mystic River at Sherrybutt, made with madeira infused with pandan. The pandan changes the finish of the cocktail, adding a nutty flavour for the last 15 seconds. I can eat or drink anything with pandan or coconut. That’s my stuff.